In the last few years, a marked shift in Saudi thinking on nuclear issues has become evident. Saudi princes have explicitly and publicly stated that a nuclear military option is something the kingdom is obligated to examine if Tehran is not stopped in its march toward nuclear weapons. In March 2011, Prince Turki al-Faisal, former head of Saudi intelligence and ambassador to the United States, called for the Gulf states to acquire "nuclear might" as a counterweight to Iran should efforts fail to persuade it to abandon its military nuclear program, a point he repeated several months later. U.S. diplomat Dennis Ross confirmed that Saudi King Abdullah explicitly warned Washington in April 2009: "If they get nuclear weapons, we will get nuclear weapons." Ross's quote of the Saudi king appears to be the first public confirmation of Riyadh's position. An unconfirmed report alleges that Abdullah made a similar statement to Russian president Vladimir Putin in their February 2007 summit. Despite its wealth and status, the kingdom operates out of a deep sense of inferiority and vulnerability: Some of its neighbors, notably Iraq and Iran, are powerful and historically hostile; its long borders are porous; it has a large Shiite population of questionable loyalty in its sensitive oil-producing regions, and its strategic installations are vulnerable. In Riyadh's view, nuclear capabilities in Iranian hands would allow Tehran to dictate the Gulf agenda—including its oil markets—as well as incite the Shiites in Saudi Arabia's eastern province, undermining the kingdom's status in the Muslim world as well as the royal family's grip on power. The public statements reflecting Saudi intent to acquire nuclear weapons may be intended primarily to convince Tehran that obtaining the bomb will have unintended consequences. They may even be intended to pressure Washington to deal more forcibly with Tehran in order to prevent it from becoming a nuclear state. Nonetheless, these statements are not something to be taken lightly. Given Riyadh's historical involvement (albeit not all of it proven) with nuclear weapons programs and its military inferiority to Tehran, it is liable to strive for a nuclear deterrent of its own. Saudi Arabia may indeed become the first nuclear state to acquire rather than develop nuclear capabilities. Riyadh would view nuclear weapons as a counterweight to Tehran. The kingdom, which has traditionally achieved its goals through behind-the-scenes maneuvering backed up by enormous wealth, would probably not change this paradigm if it acquired a nuclear weapon. The lack of transparency typical of Saudi decision-making does not afford knowledge of what, if any, decisions have been made on nuclear matters. Decisions on sensitive issues are made in very secretive settings usually involving the king and the brothers closest to him and are affected by a sluggish process that tends to seek consensus through consultation within the family, requiring the placation of various factions within it and within the broader circles of regime supporters. Due to its extremely limited research and development capabilities and know-how, Riyadh's possible nuclear pursuit is likely to be done with external help and acquisition of an off-the-shelf deterrent. It has nowhere near the level of indigenous technical capacity needed to produce, maintain, or deploy nuclear weapons. No long-term strategy for developing its nuclear sector has been publicly issued, nor does Riyadh possess the necessary institutional support (across regulatory, technical, and legal fields) to effectively retain nuclear deployments. Therefore, it might partner with China or Pakistan or both, which have the necessary technological and human infrastructures. Saudi Arabia's track record merits some well-placed concern over the issue of nuclear weapons. In the late 1980s, China secretly supplied Riyadh with thirty-six CSS-2 intermediate-range ballistic missiles (IRBMs). A recently inked civilian nuclear cooperation deal with Beijing, supplier of the CSS-2s and reported supplier of newer and still nuclear-capable DF-5 ICBMs, may also be troubling. Furthermore, the recent inauguration of a new command and control center belonging to the Strategic Missile Force near Riyadh raises a question: Why would Saudi Arabia invest billions in updating its strategic command and control facilities if it still possesses only outdated Chinese missiles? The visit by the late Saudi defense minister, Crown Prince Sultan, to a uranium enrichment facility and a Pakistani missile production plant near Islamabad in 1999 (hosted by A.Q. Khan, accused of passing on nuclear secrets) raise concerns about Riyadh's future relations with Islamabad in this matter. On at least one occasion, Khan visited Riyadh, and reports have surfaced about Pakistani scientists coming to Saudi Arabia under the guise of Hajj pilgrims. The Saudis are increasingly likely to turn to Pakistan, a fellow Sunni nation with nuclear expertise, for aid in confronting Iranian ambitions. 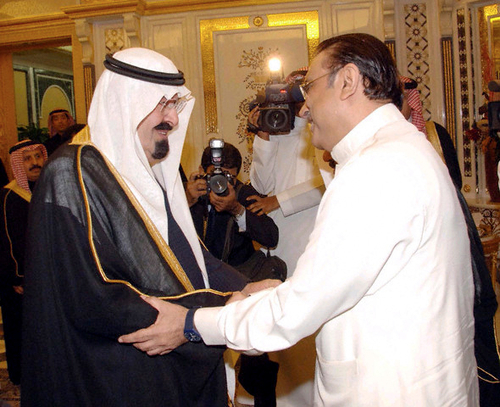 Saudi King Abdullah (left) welcomes Pakistani president Zardari to Riyadh, July 2011. These concerns and connections are not merely speculative. Islamabad's willingness to provide security support for Riyadh, should the Saudis feel that there is a real danger to the kingdom's stability, was put to the test in the spring of 2011. The Saudi royals' fear that the Shiite uprising in Bahrain would spread to Shiite centers in northeast Saudi Arabia (where most of the kingdom's oil reserves are located) prompted Riyadh to ask Islamabad to place an expeditionary force on alert ready to be deployed on Saudi soil should the security situation deteriorate. Pakistan responded positively to the Saudi request. Riyadh views Islamabad as its strategic hinterland. The Saudis are behind the financing of many arms deals, and in exchange, receive training of their aerial and naval personnel by the Pakistanis. During a visit by Pakistani president Zardari to Riyadh in July 2011 (a visit that reportedly enhanced the strategic relations between the countries), King Abdullah thanked him for his support in Bahrain, where Pakistani mercenaries helped put down the Shiite uprising, and in maintaining regional stability. A month later, Pakistani prime minister Yousuf Raza Gilani also visited the kingdom, asking for Saudi help with oil supplies in light of Islamabad's economic situation and Washington's threats to cut off support; it is unclear what Pakistan promised in exchange for the aid. Riyadh maintains a very close relationship with the heads of Islamabad's military and intelligence services. This is significant in the nuclear context because from the start, the Pakistani nuclear program was under the control of the military establishment without any real involvement on the part of the political leadership. The two nations, both with Sunni majorities, border Iran on two sides and are interested in curbing Tehran's power and influence. Pakistan, lacking the monetary resources, has the requisite knowledge and skilled manpower for developing nuclear arms whereas Saudi Arabia is wealthy but lacks the relevant infrastructure and trained personnel. One cannot rule out the possibility that Riyadh may seek to balance Tehran's power by increasing cooperation in the nuclear field with its long-standing friend, despite the political risks of jeopardizing well-established defense relations with Washington. In October 2010, the head of the strategic planning unit of Pakistan's armed forces, who is responsible for the production, security, and storage of the nation's nuclear weapons, said that Islamabad had the right to provide its expertise in the nuclear field to other nations. In the past, both Islamabad and Riyadh denied such a scenario. Should Saudi Arabia find itself in a sensitive security situation, it may seek to capitalize on its investment in the Pakistani nuclear program and pressure Islamabad for assistance. It is unclear whether there is, in fact, a binding nuclear agreement between the states though the assessment is that both states have at least discussed the option. If such an agreement exists, the two have presumably trained for operational cooperation in this field. Gary Samore, President Obama's advisor on arms control, has said that the possibility of Pakistani nuclear forces being placed in Saudi Arabia cannot be ruled out. Although there has never been a precedent of one state selling or transferring actual nuclear warheads to another, there is the precedent of exchange of nuclear technology between Pakistan and North Korea as well as proliferation of forbidden nuclear equipment and know-how to countries including Iran and Libya and possibly Syria or Saudi Arabia. As Tehran progresses, Riyadh is likely to exert more pressure on Islamabad to fulfill its presumed commitments. It is by no means certain that Pakistan will yield to Saudi pressure and inducements, but it is impossible to rule out the deployment of Pakistani fighter jets or surface-to-surface missiles with nuclear warheads, controlled by Pakistan, on Saudi soil. At the same time, the kingdom is accelerating its independent nuclear development—one of the largest development projects in its history—as another option in response to Iran. Saudi Arabia has in recent years started to prepare openly for the development of a civilian nuclear program and is broadening efforts to construct a knowledge base in the field, possibly as another way of establishing nuclear military capabilities over the long term. It has initiated a string of projects and signed cooperation agreements with France, Russia, the United States, South Korea, and China. In 2006, Riyadh called for the Gulf Cooperation Council (a regional bloc that includes Kuwait, the United Arab Emirates, Bahrain, Qatar, and Oman) to develop a shared program to use nuclear technologies for peaceful purposes in accordance with international treaties. The Saudi foreign minister, Prince Saud al-Faisal, sought to assuage concerns about possible intentions to develop nuclear weapons stating, "It is no secret and we're doing everything out in the open. Our goal is to pursue technology for peaceful uses—no more and no less." Yet notwithstanding similar declarations over the years, the kingdom has signaled that it would not surrender the capability to enrich uranium on its soil, which continues to raise doubts about its intentions. In April 2010, King Abdullah called for the establishment of a national body for nuclear research and development. In addition, he stated that Riyadh would invest more than $100 billion over two decades to establish no fewer than sixteen nuclear reactors with the first reactor set to be connected to the power grid by 2020. While the civilian nuclear program seems designed to be a symbolic response to Tehran's nuclear project in the short term, this does not preclude the possibility of its serving as a cover or preliminary stage for a military nuclear project in the future. In June 2005, Riyadh signed the Small Quantities Protocol with the International Atomic Energy Agency (IAEA), but this protocol exempts it from intrusive inspections and makes it difficult for the IAEA to ensure there is no forbidden development underway. The concern that loopholes in the protocol could allow nations to develop military nuclear capabilities has moved the IAEA to attempt to change it. Riyadh's response was to hurry to sign the present text, despite Washington's opposition. A signal from Riyadh that it intends to pursue the nuclear route may indeed be an effective way to pressure Washington to demonstrate its commitment to defend the kingdom more convincingly. Saudi doubts about their U.S. allies preceded the Obama administration's conduct during the recent Arab upheavals but have been intensified by them. In the last two years, the kingdom has missed few opportunities to express its displeasure with Washington's policy toward Tehran. Although Secretary of State Hillary Clinton promised to extend the U.S. "defense umbrella" to the Gulf states should Tehran acquire military nuclear capabilities, this type of declaration allays few fears as it is liable to be seen as a grudging acceptance of a nuclear-armed Iran. While Washington would not have to deploy nuclear forces on Arabian soil to deter aggression, such a move would make the message of deterrence more credible and calm Saudi nerves. However, any U.S.-Saudi security arrangement would likely be covert so as not to embarrass the kingdom vis-à-vis elements opposed to hosting "infidels" on "sacred" lands. Another possibility would be to deploy nuclear forces offshore. A hint that such an option might be in the making came in March 2010 when the U.S. navy fired a missile capable of carrying a nuclear warhead from a submarine near the Saudi coast. Continued Iranian progress toward a nuclear weapon, Iraq's increasing alignment with Tehran, and an expedited U.S. exit from Afghanistan are all changing the Saudi strategic landscape. The Obama administration's "lead from behind" approach in Libya and its hesitation to get involved in the Syrian civil war all contribute to a reassessment of U.S. commitments. With the U.S. "pivot to Asia"—taking the form of a series of military, economic, commercial, and diplomatic initiatives aimed at contending with the rising power of China—and a changing global energy map due to expansion of oil and natural gas production in the United States, Riyadh and others are beginning to prepare for a post-U.S. Middle East. According to recent reports, Washington is considering expanding its nuclear cooperation with Riyadh on the basis of a 2008 memorandum of understanding: In exchange for foregoing the operation of nuclear fuel cycles on its soil, Saudi Arabia was to receive nuclear assistance. Such a move, should it come to pass, may be meant to persuade Riyadh to abandon its strategic goals, prevent other players from gaining a foothold in the attractive Saudi market, and challenge Tehran's nuclear policy. The United States is still Saudi Arabia's most effective security support, but if Washington distances itself from regional matters, the gradual entrance of new players into the Gulf is inevitable. The question of Saudi acquisition of a nuclear deterrent is more relevant than ever when both enemies and friends of the United States are looking at a possible regional drawdown on Washington's part as well as a lack of support for the pro-Western regimes that remain in place. If the U.S. government provides Riyadh with formal security guarantees, it would be natural for it to demand that the kingdom forego its strategic goals. But Riyadh's inclusion under a U.S. defense umbrella is not a given and depends both on the quality of relations between the two countries and other Saudi considerations. Riyadh remains skeptical over Washington's willingness to come to its aid and may thus seek to purchase a nuclear deterrent, which would provide it with more freedom vis-à-vis its stronger ally. Under present circumstances, it is not unreasonable for Riyadh to rely on other states for its defense in addition to Washington for the simple reason that it has done so in the past. Likewise, it is more than likely that the Saudis will not act transparently because they have acted in secret previously. After Iran, Saudi Arabia is the number one candidate for further nuclear proliferation in the Middle East. Open source evidence remains circumstantial, but perhaps more than any other regional player, Riyadh has the requisite ideological and strategic motives as well as the financial wherewithal to act on the option. The kingdom may conclude that its security constraints as well as the attendant prestige and influence generated by having a bomb outweigh the political and economic costs it will pay. The difficulty in stopping Tehran's dogged quest for a nuclear capability coupled with Riyadh's doubts about the reliability of Washington is liable to encourage Riyadh to shorten timetables for developing an independent nuclear infrastructure, as well as to opt to purchase a turnkey nuclear system, an off-the-shelf product, or to enter into a security compact of one sort with another power. Sunni-majority Pakistan has emerged as the natural candidate for such an arrangement. Heavy U.S. pressure is likely to be brought to bear on the Saudis not to acquire nuclear capabilities. Indeed, it seems that, at present, the price Riyadh is likely to pay should it acquire military nuclear capabilities might outweigh the advantages of such a move. But strategic interest, motivated by considerations of survival, could have the upper hand. Should it seem that the kingdom's vital security interests are threatened, it may prefer to take a series of steps, including obtaining a nonconventional arsenal, to reduce risks and ensure the continuity of the House of Saud. Yoel Guzansky is a fellow at the Institute for National Security Studies, Tel Aviv University. His main research area is Gulf security. He has also served as Iran coordinator at Israel's National Security Council. His recent publications include The Gulf States in a Changing Strategic Environment (2012), One Year of the Arab Spring: Global and Regional Implications, and The Gulf States: Between Iran and the West (co-editor, 2012). Kuwait News Agency, Mar. 21, 2011. The Wall Street Journal, June 2, 2011; The Guardian (London), June 29, 2011; The Jerusalem Post, June 30, 2011. Ha'aretz (Tel Aviv), May 30, 2012. Thomas Lippman, Saudi Arabia on the Edge: The Uncertain Future of an American Ally (Washington, D.C.: Potomac Books, 2012), pp. 229-30, 236-7. Joseph Kostiner, "The GCC States and the Security Challenges of the Twenty-First Century," The Begin-Sadat Center for Strategic Studies, Bar-Ilan University, Mideast Security and Policy Studies, no. 86, Sept. 2010. Shmuel Bar, "Culture of Command and Control of Nuclear Weapons in the Middle East: Saudi Arabia," working paper, Twelfth Herzliya Conference, Jan. 2012. Mark Jansson, "Conceding the Saudi Nuclear Breakout," Center for Strategic and International Studies, Washington, D.C., Feb. 21, 2012. "Pakistani Journalist Examines Saudi-Pakistani Nuclear Cooperation," Middle East Media Research Institute (MEMRI), Washington, D.C., Special Dispatch, no. 4205, Oct. 14, 2011. William Potter and Gaukhar Mukhatzhanova, eds., Forecasting Nuclear Proliferation in the 21st Century: A Comparative Perspective (Stanford: Stanford University Press, 2010), p. 93. Asia Times (Hong Kong), Apr. 2, 2011. Bruce Riedel, "Brezhnev in the Hejaz," National Interest, Sept.-Oct. 2011. Francisco Aguilar, Randy Bell, Natalie Black, Sayce Falk, Sasha Rogers and Aki Peritz, "An Introduction to Pakistan's Military," Harvard Kennedy School, Belfer Center, Cambridge, July 2011. Islamic Republic News Agency, Aug. 10, 2011. Rolf Mowatt-Larssen, "Nuclear Security in Pakistan: Reducing the Risks of Nuclear Terrorism," Arms Control Today (Washington, D.C.), July/Aug. 2009. Pervez Hoodbhoy, "Iran's bomb and Pakistan," The Express Tribune (Karachi), Jan. 15, 2012. "Head of Pakistan's Nuclear Program: Pakistan Has the Right to Use Nuclear Weapons Should the Need Arise," MEMRI, Special Dispatch, no. 3330, Oct. 31, 2010. Bruce Riedel, "Enduring Allies: Pakistan's Partnership with Saudi Arabia Runs Deeper," Force, Dec. 2011. Thomas Lippman, "Nuclear Weapons and Saudi Strategy," Policy Brief, no. 5, Middle East Institute, Jan. 2008. "Country Profiles: North Korea, Nuclear," Nuclear Threat Initiative, Washington, D.C., Aug. 2012. William Langewiesche, "The Wrath of Khan," The Atlantic, Nov. 2005. Asharq al-Awsat (London), Oct. 15, 2012. The Wall Street Journal, Jan. 16, 2012. The Gulf News (Dubai), Dec. 11, 2006. Arab News (Riyadh), June 17, 2010; Asharq al-Awsat, Oct. 15, 2012. Arab News, June 1, 2011. Global Security Newswire, Nuclear Threat Initiative, Washington, D.C., June 16, 2005. The Washington Post, May 16, 2011; Asharq al-Awsat, Nov. 8, 2012. Fox News, July 22, 2009. The Washington Post, Mar. 31, 2010. The Wall Street Journal, July 30, 2011. Related Topics: Saudi Arabia | Yoel Guzansky | Spring 2013 MEQ receive the latest by email: subscribe to the free mef mailing list This text may be reposted or forwarded so long as it is presented as an integral whole with complete and accurate information provided about its author, date, place of publication, and original URL.